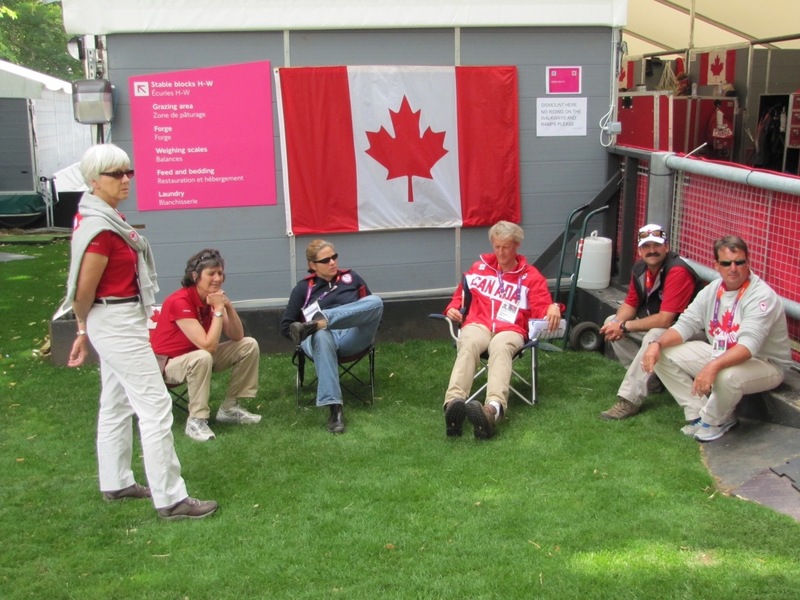 I’m squeezing in another quick blog before I have to head off to find the Cosport Will-call office with Dressage Team Manager Christine Peters and Assistant Team Leader Tina Collins. 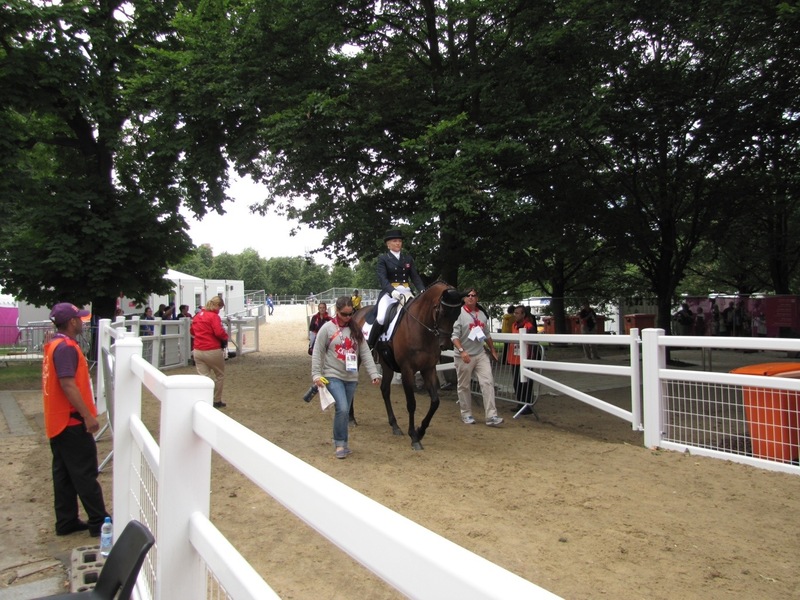 Today is Dressage Day 2 for Eventing. What started off as a brilliant day with blue skies, sunshine and very comfortable 20 degrees weather has turned into colder, blustery, thundery and lightneny (sp!) rain. The day started VERY early for Tina, who had to be at the venue box office at 8 am to pick up tickets. LOCOG have a terrific program where they make available 2 tickets per athlete for every session in which they are competing. These can only be ordered by the respective National Olympic Committee (NOC). Our Canadian Olympic Committee takes care of this, and we are VERY fortunately to have Suncor/Petro-Canada’s generosity as they are paying for ALL of these tickets for every Canadian athlete. How great is that!?!?!?! 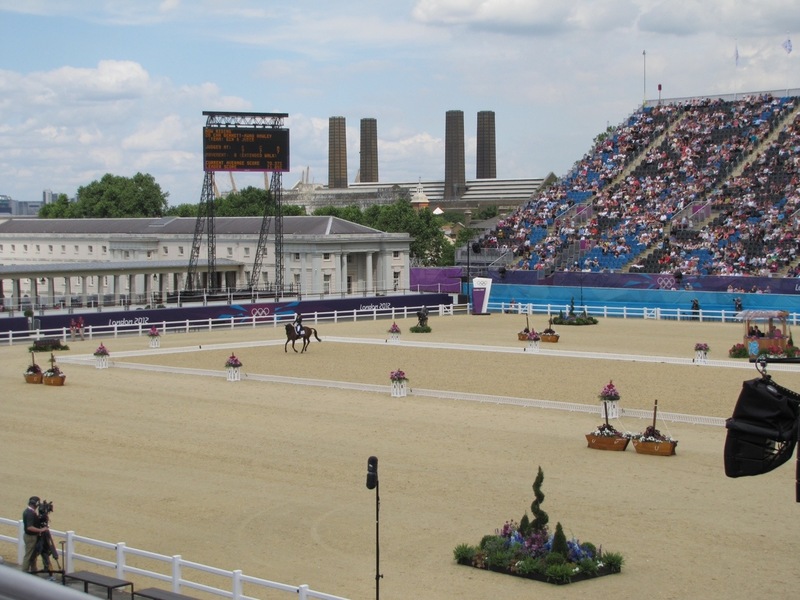 Not so great are the many “hiccups” LOCOG is experiencing with this first-time-ever program. This has lead to a lot of anxiety both for the COC, and for us. The tickets for today were not made available for purchase until 6am. Luckily the COC are amazingly awesome (big shout-out to COC Ticketing Officer Allan Koyanagi!!!) and they have been ordering some of the best tickets in the house and getting them in blocks so all Canadians can sit together. 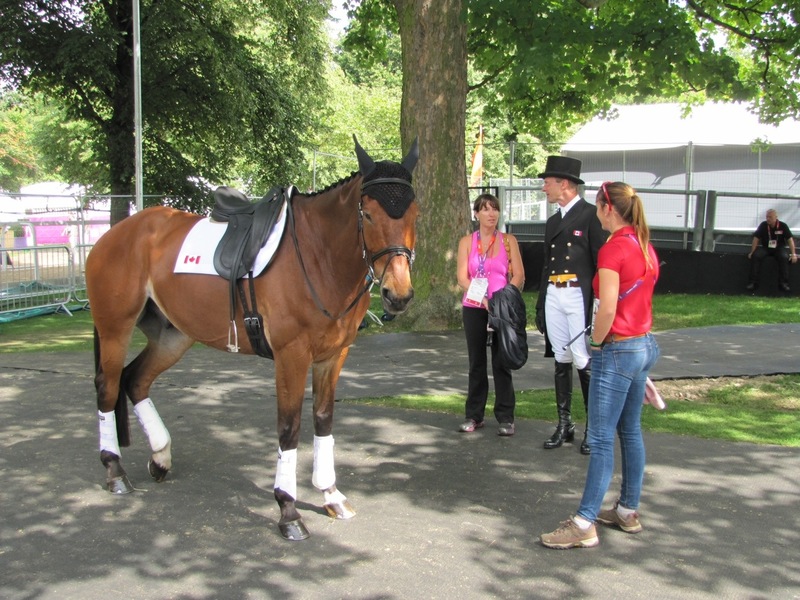 Tina told me that we rec’d all 10 tickets for today (we have 5 Eventing athletes). Ireland and New Zealand were also standing with Tina to get theirs. The Kiwis only rec’d 1/2 of theirs, and Ireland rec’d non……yikes! Royalty was in the house as the Princess Royal and Prince Phillip were on hand to see Zara Phillips lay down a lovely ride. 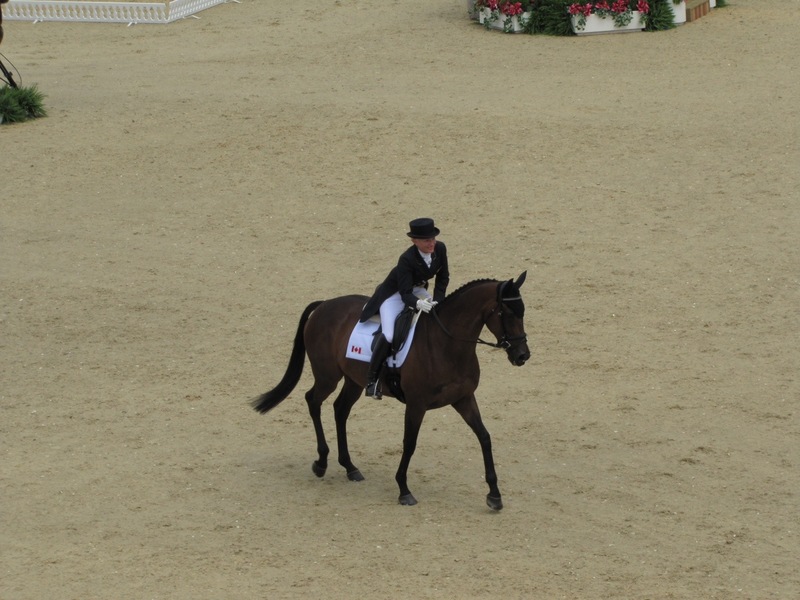 Tina and I had the opportunity to see Jessica Phoenix and Exponential’s test. They looked as elegant as always, but unfortunately had a couple of small bobbles. But still finished with a very respectable score of 54.80 penalty points. Then the weather took a nasty turn. Blustery winds, rain, thunder, lightening. Thankfully Tina and I had already made our way to Devonport House (Grooms Hotel) to work upstairs in the office area and catch up on emails and get some blogging done……but I feel badly for anyone who was in the training and warm-up rings. They actually had to hold the competition at least twice. As I write this, Rebecca Howard & Riddle Master should have already gone…..so I’ll have to look up her score. Our Dressage team are all settled in and enjoying their first day of training and checking out the rings. I managed to grab a couple of shots of Ashley and Diane. Here are a few pics….and then onto cross-country day tomorrow. 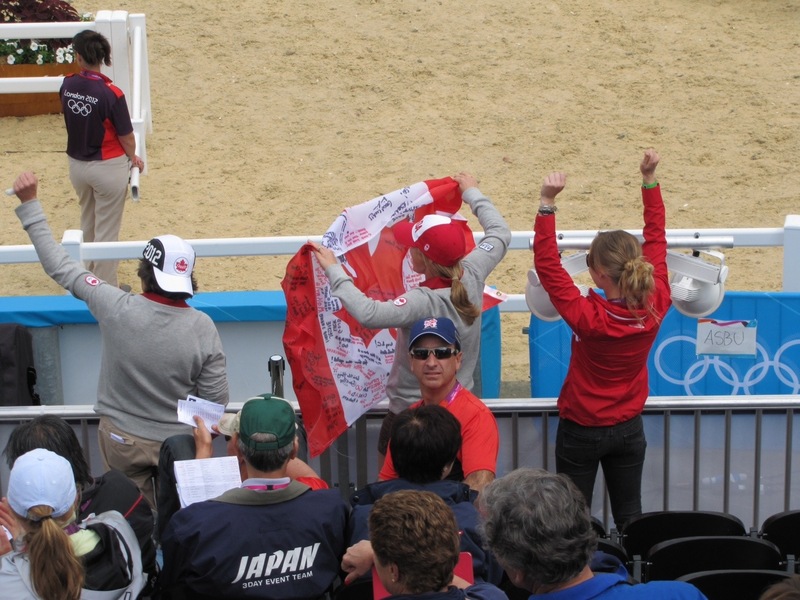 Canada chef de mission Mark Tewksbury and assistant chef de mission Sylvie Bernie are hoping to make it out – yay! The picture of poise & grace under pressure. 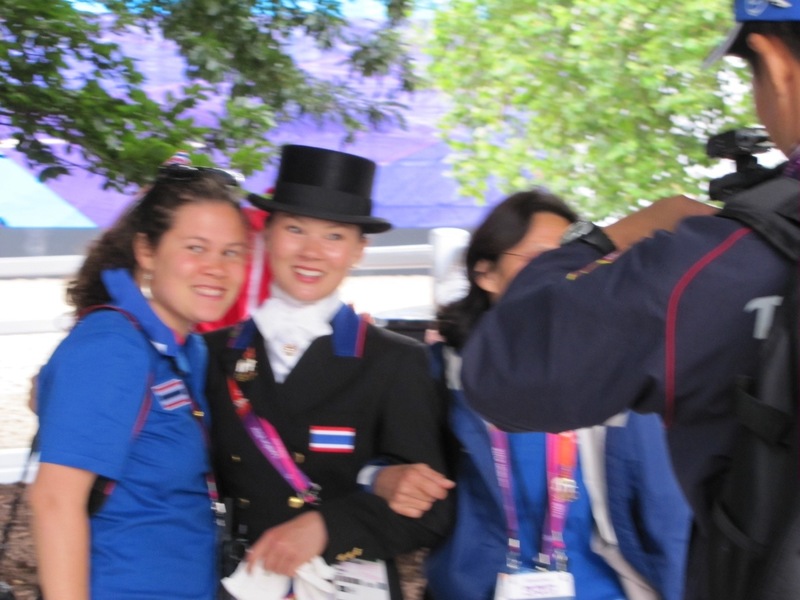 Thailand’s Nina Ligon in the mixed zone following her ride.